BMX RACING DOES NOT REQUIRE A LOT OF EXPENSIVE EQUIPMENT. MOST RACERS START WITH THEIR 20" STREET BIKE BY REMOVING THE CHAIN GUARD, THE KICKSTAND AND REMOVING THE FREESTYLE PEGS FROM THE AXLES IF EQUIPPED. WHAT OTHER EQUPMENT DO I NEED? FIRST, A HELMET IS REQUIRED, AND THE ABA RECOMMENDS ONE WITH FACE PROTECTION. YOU WILL ALSO NEED TO WEAR A LONG SLEEVE SHIRT, LONG PANTS AND ENCLOSED SHOES. SIMPLY VISIT OUR TRACK DURING THE PRACTICE OR RACING TIMES AND ASK FOR A MEMBERSHIP APPLICATION OR INFORMATION. YOU CAN WATCH THE RACES, TALK TO OTHER BMX FAMILIES, OR GIVE IT A TRY YOURSELF. USA BMX OFFERS A ONE TIME ONLY, 1 DAY FREE TRIAL MEMBERSHIP OR 30-DAY TRIAL MEMBERSHIP FOR $45.00. THIS ENTITLES YOU TO RACE AT YOUR LOCAL TRACK AND PROVIDES YOU WITH SECONDARY INSURANCE COVERAGE. 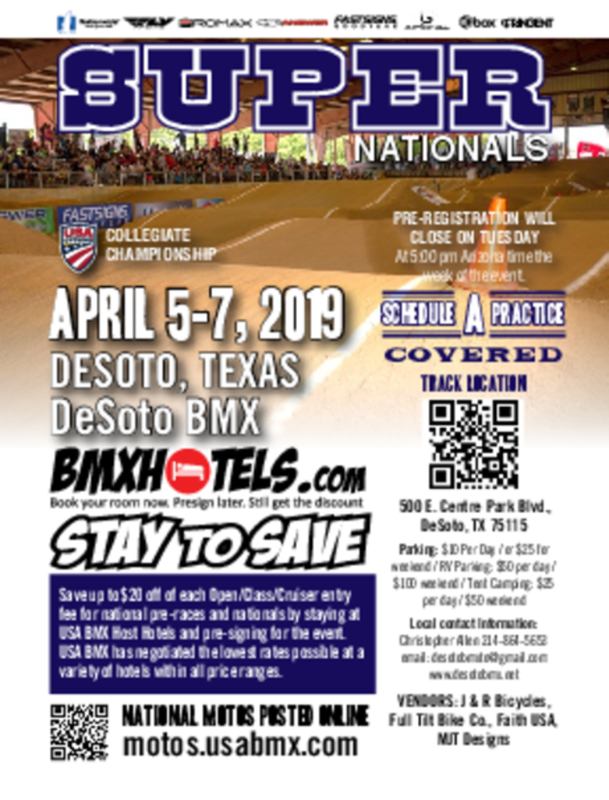 A ONE YEAR MEMBERSHIP COSTS $60.00 AND ALLOWS YOU TO RACE ON USA BMX TRACKS NATIONWIDE. WITH THE FULL MEMBERSHIP YOU WILL ALSO RECEIVE THE PULL MAGAZINE, THE MONTHLY MAGAZINE WITH CURRENT POINT STANDINGS AND NATIONWIDE RACE COVERAGE. ONCE YOU HAVE BECOME AN USA BMX MEMBER, THE ONLY OTHER COST WILL BE THE RACE DAY ENTRY FEE. PRACTICE DAY $7, RACE DAY $15. THE ENTRY FEE ENTITLES YOU TO BE A PARTICIPANT IN THE DAY'S ACTION. A TYPICAL BMX RACE INCLUDES 2 QUALIFYING MOTOS ALONG WITH A MAIN EVENT. IN THE MAIN EVENT, YOU RACE FOR AWARDS, DETERMINED BY YOUR FINISH, ALONG WITH THE PRECIOUS ABA POINTS.